If your Facebook feed is anything like mine, you’re probably being inundated daily by glowing couples gazing into each others eyes over a rounded baby bump. 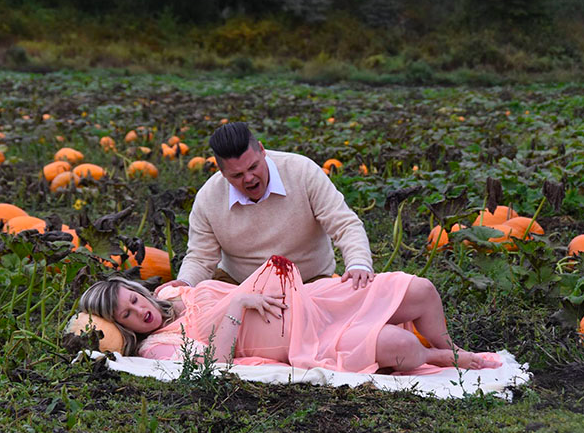 Much like baby showers and gender reveals, the tasteful maternity photo shoot has become something of a modern day milestone among expectant parents. This is all well and good of course, but it’s always good fun when mamas and papas to be deviate from the norm a bit with something wacky and unexpected. Expectant parents Todd and Nicole Cameron, from British Columbia, are big fans of the Halloween season, and love an excuse to dress up and have some fun. So when it came to their maternity shoot, flowers and prettiness just wouldn’t cut it. 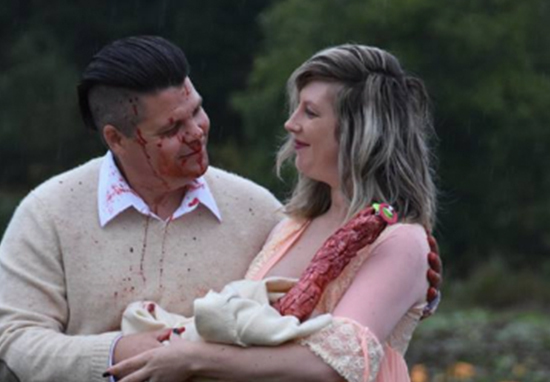 This unique couple were after a shoot which reflected their love for all things creepy. 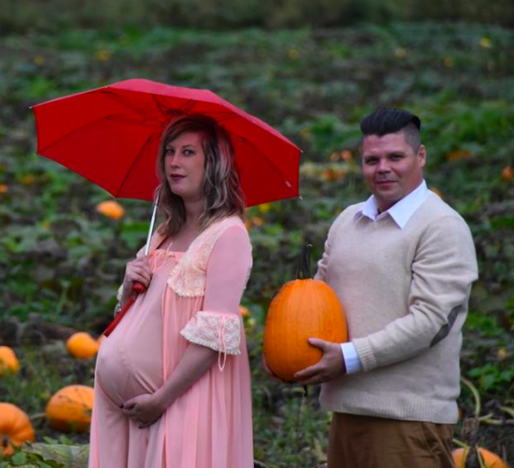 The shoot itself was taken in a autumnal pumpkin patch, and starts off in a fairly normal fashion; with the couple posing together under an umbrella and Todd leaning down to lovingly kiss Nicole’s bump. 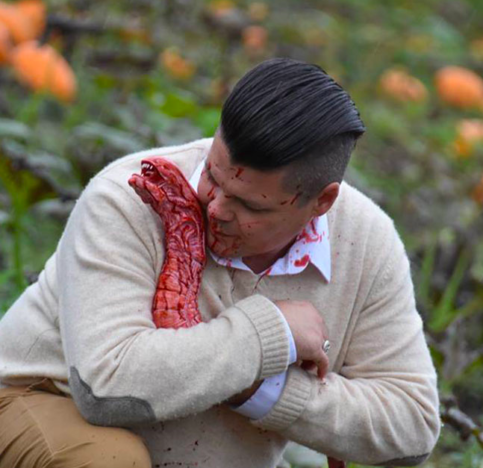 However, the shoot quickly takes a gory turn. Drawing from that famous scene in Alien, Nicole can be seen lying on the ground as an alien bursts from her stomach in a bloody eruption. The rest of the photos grow increasingly hilarious. 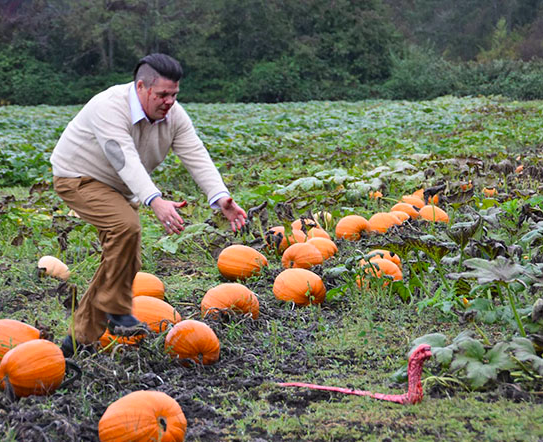 We see Todd chasing the alien ‘baby’ as it scampers away across the pumpkin patch. The parents can then be seen cradling their gruesome child in a blanket, beaming at each other with pride. The alien even has a dummy in its little mouth, which is weirdly kind of adorable. This came about when I was at a garage sale and found a model of an Aliens Chestburster. I brought it home, of course, and as I was putting it together and painting it, the idea of a maternity shoot came to me. Nicole wasn’t interested in a traditional maternity shoot so our planning began. I took care of the general storyline and props (including the hand carved pumpkin ‘alien pod’ and Nicole took care of finding our wardrobe. The funniest part for us was laying in a cold wet field, covered in fake blood and just laughing our hearts out, hoping that the farm hands wouldn’t drive by and see us in our current conditions! The amazing photographs were taken by Li Carter, a local photographer from Nanaimo, British Columbia, and this isn’t the first time she has captured special moments in the couple’s life in an eccentric manner. Li Carter is a local amazing photographer and a dear friend of ours and has been a part of many fun photo shoots for our family. She was definitely excited from the first message and found our idea hilarious but not surprising (having known us for years)! 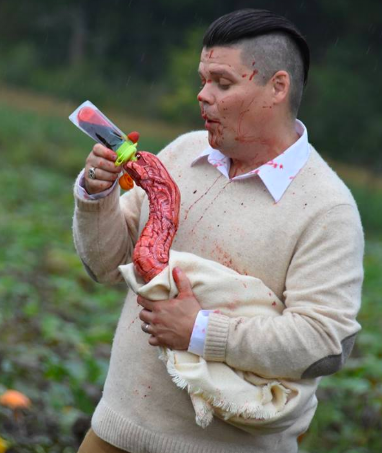 The photos quickly went viral, with friends of the couple greatly appreciating their dark sense of humour. Omg this is my highlight of 2018 so far haha! Nicely done Todd Cameron. You guys always keep us guessing. This is sadistically hilarious! Li’s Instagram can be found here. Find out more about Todd Cameron at @thedudeabidez, and about photographer Li Carter at @happysqueak.